Sorbitol, fructose, mannitol, wildberry flavor, sodium bicarbonate, magnesium stearate, French vanilla flavor. Take 1 lozenge every 2 hours up to 6 lozenges per day. Allow lozenge to dissolve slowly in the mouth. This product should not be used for more than 7 days. 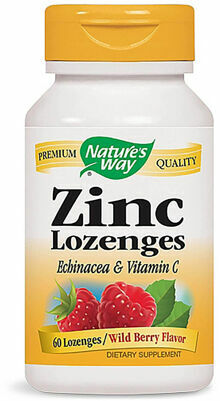 Nature's Way® Zinc Lozenges contains NO yeast, milk, lactose, wheat, soy. Sorbitol, Fructose, Mannitol, Wildberry Flavor, Sodium Bicarbonate, Magnesium Stearate, French Vanilla Flavor, Stevia Dried Leaf Extract. Protects Against Free Radicals Of The Winter Season! Health & longevity through the healing power of nature-that's what it means to Trust the Leaf. Zinc helps protect against free radicals and is recognized as an important nutritional support during the winter season. 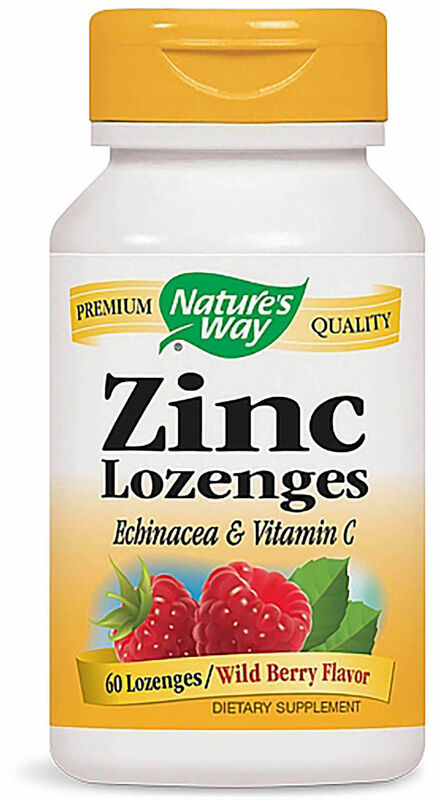 Our Zinc Lozenge is carefully tested and produced to certified quality standards.